Continuing with my meet and greet of California pets, this is our dog, Sydney. She is a 10 year old collie. 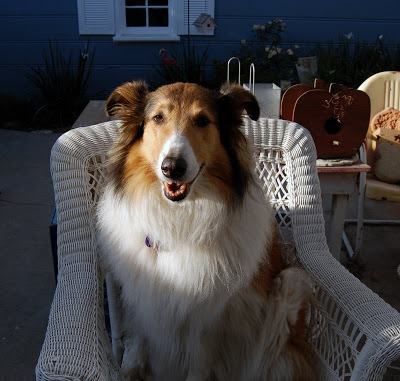 She is far from being “Lassie-like”….but we still love her crazy self. Syd likes to sit in chairs…a lot. She also likes to poke her head through the cat door in the kitchen. We sometimes call her “bear” (don’t know why) or “head” (when she pops her head in the cat door) or “Foo” (don’t ask), or some combination of them like “Sydney-foo-bear” or “Foo-head”. Yes, my mom and I are insane. What a good puppy…I want one! it took me so long to write.I’ve already talked to you about your beautiful dog. You captured the essence of Sydney with this picture……..sitting less than properly, in a chair, no less, with a big smile! What a life. Gotta love that pup!